I am pleased to share this delightful story from Madras – Chennai, my birthplace in India. 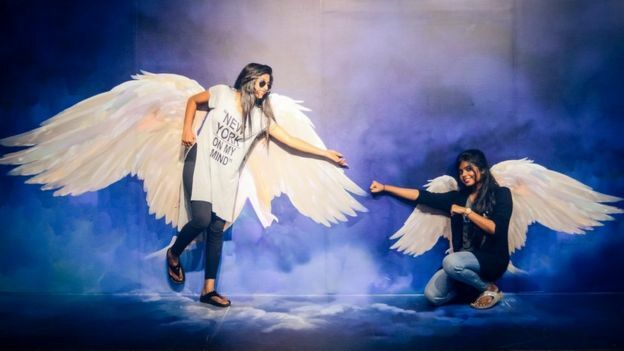 The first ‘Click Art’ Museum of India opened in Chennai in April 2016 and is entertaining thousands of visitors using Magic of Illusion. The selfie-taking chimpanzee is a huge hit with the visitors. 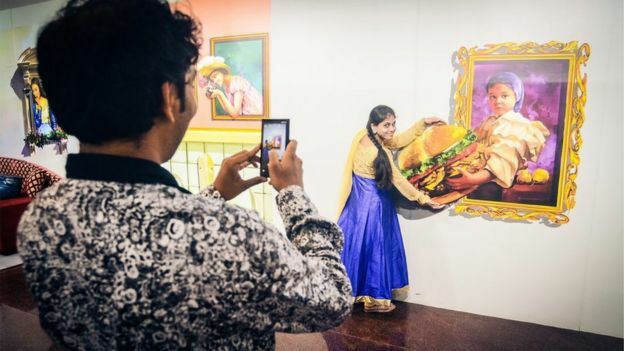 India’s first Click Art Museum, in the southern city of Chennai, has been visited by more than 47,000 people since its opening in April. The BBC’s Geeta Pandey takes a peek into this world of wonders to find out why it is drawing in the crowds. Delightful squeals welcome me as I step into this museum on the East Coast Road. Once inside, I feel like Alice in Wonderland. There is Adam stepping out of the frame to hand over an apple as Eve watches, Atlas is gifting away a massive diamond and Monalisa is pouring a steaming cup of coffee. You can take a selfie with a chimp and play with a dolphin. And before you leave, you can also collect your Oscar trophy. But hang on, the journey is fraught with danger too – can you prevent your body from being cut into halves? Are you brave enough to fight the huge snake that’s slithered up right behind you? Can you fight the bull that’s charging towards you? And can you survive Bruce Lee’s lethal kick? To contemplate my survival strategy, I sat down on the nearest chair. 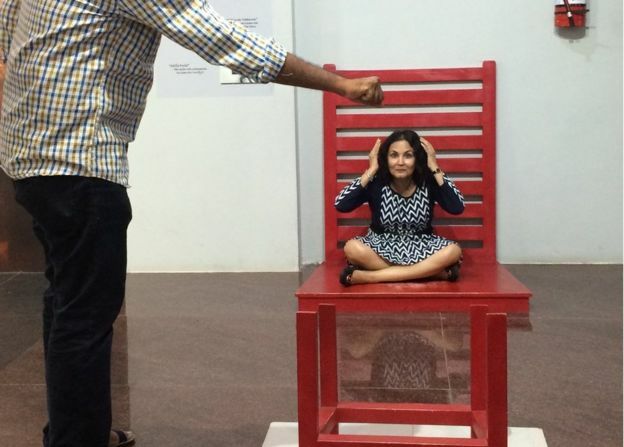 It was a bad idea – I got shrunk! 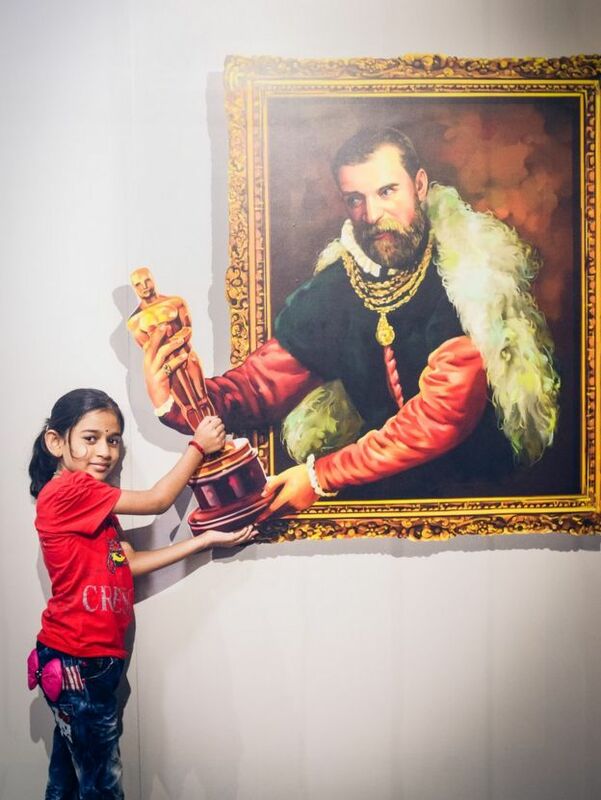 Engineer Loganathan P says he works under tremendous pressure and a visit to the museum helped him relax The museum has 24 artworks on display, which have been created using 3D paintings and optical illusion. They offer the viewer an opportunity to interact and become part of the scenery. 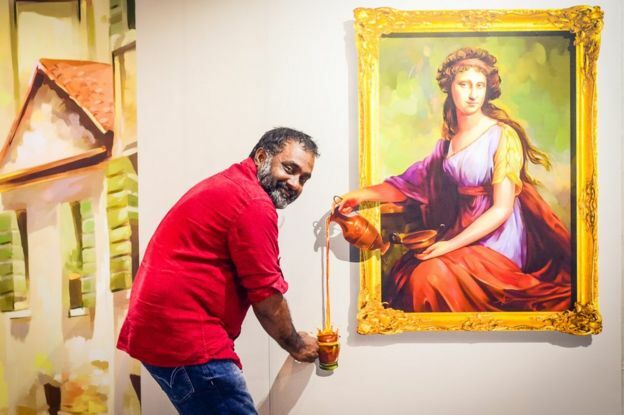 Tamil artist AP Shreethar, who has created all the exhibits, says he drew inspiration from similar click art galleries in Singapore, Malaysia, Phuket and Hong Kong and that it took him three and a half years to put together this museum. 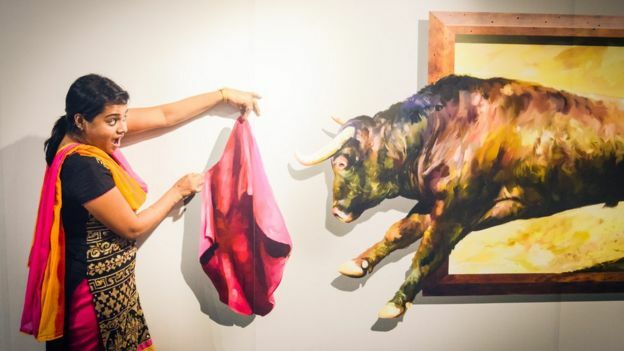 “Art galleries in southern India are generally very boring. 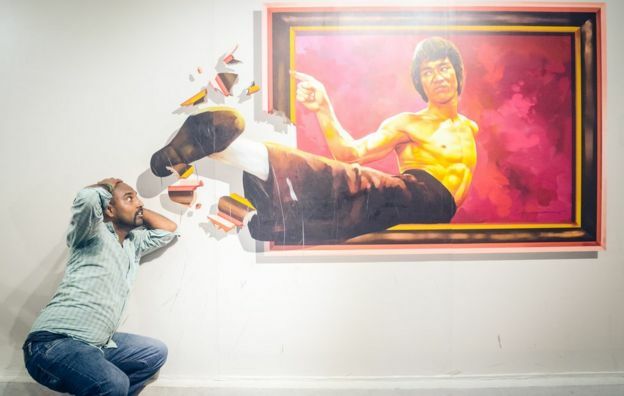 Not many people are interested in art and few visit an exhibition,” he told the BBC. 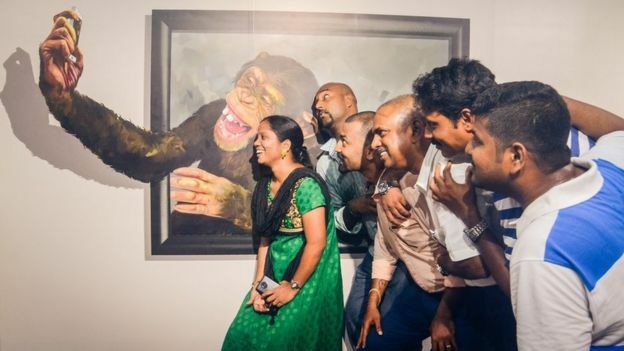 Artist AP Shreethar said even he didn’t anticipate this kind of response The museum has had more than 47,000 visitors since it opened its doors on 14 April. Entry is ticketed at 150 rupees ($2.24; £1.68) for adults and 100 rupees for children – which is not cheap, but it has been no deterrent with hundreds of people visiting daily. At the weekends, Mr Shreethar says the museum draws up to 2,000 visitors in a day. The paintings seem to be a hit with the children as well as adults. Seven-year-old Sahasra Rushika and her four-year-old brother Atharva Raghav, who are visiting with their parents from Bangalore, are running around posing for pictures. “The angel is the best, it’s my favourite, it can fly,” says Saharsa. When I got shrunk Nearby, grown men and women are posing too, cellphones have been whipped out from pockets and purses, some are taking selfies while others are calling out to friends and colleagues to take their photos. “I’m an engineer, we work under tremendous pressure. This is a surprise visit our office organised for us and we’re enjoying it immensely,” says Loganathan P who is visiting with his colleagues. “This place is very nice, and I’m feeling very relaxed and happy. It’s taken me back to my childhood days,” he adds. Can you fight a bull charging towards you? This family from Bangalore appeared to be enjoying their visit As he poses for a photograph with some of his colleagues, I ask him if he’s going to share his photos on Facebook. “They’re being sent around the world to friends and family now on Whats App,” he says. 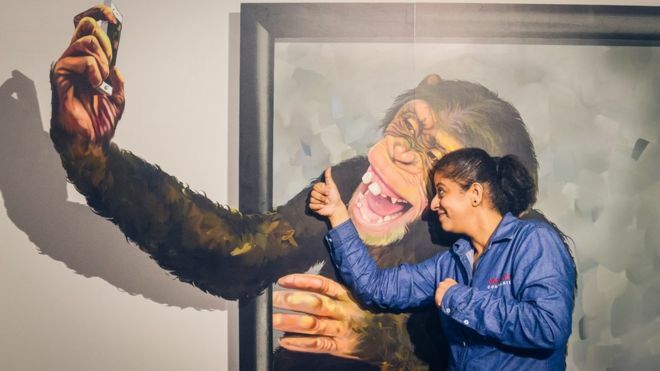 His colleague Nirmala Mani, teases him that he is behaving like the selfie-taking chimp which she describes as “the most awesome work here”. “It is very satisfying to see people enjoying themselves like this,” Mr Shreethar says. Buoyed by the success of this project, now he plans to open 22 more museums, including in Delhi, Goa, Mumbai, San Francisco and Malta. Click art, he says, is perfect for today’s generation, obsessed with photographs and selfies. Mr Shreethar says most visitors take 50 to 60 pictures at the museum and that their Facebook page has been tagged in nearly a million photographs. “I knew the click art museum would be a hit, but even we are astonished by the interest,” he adds. Story From Madras – Chennai, My Birthplace in India.